A lot has been going on this weekend aside from the occasional political rally, and surprisingly, in the run-up for this weekend, it almost felt like for once people found something other than politics to fight about: Valentine's Day. For some, it was time to do some serious shopping for flowers and red teddy bears. Others looked at the occasion with disdain, almost refusing to make any plans, labeling the day as a 'marketing spoof for morons'. But it's not only those in relationships that disagree: For some singles, the day offered an opportunity to either meet someone at a singles event, or confess a secret infatuation to someone in a hopelessly romantic way. And naturally, it was just as any another day for the rest of them. Has consumerism taken over this holiday ? Can't say that I disagree, but hasn't it taken over almost every other holiday ? We gladly give in to the extravagant purchasing of presents and ornaments for Christmas, even though we fully understand that it is a completely separate aspect of the holiday than the religious one. It is common for most people to take part in the distribution of presents, whether or not they are taking part in the religious aspect of Christmas. You hardly ever see a religious person refusing to celebrate simply because the holiday has been almost entirely taken over by consumerism. And even though spending may have become the most flagrant aspect of holidays such as Christmas and New Year's Eve, the majority of people tend to keep their eyes on what's important: sharing their joy with their loved ones. But we were talking about Valentine's Day, and what's important about this day, is reminding that person you hold dearest of just how special he/she is to you, something that probably no Hallmark-type product is going to do for you. 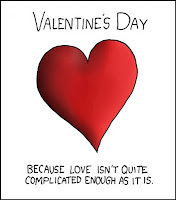 It might be too late now, but try to keep this in mind for the next time Valentine's day comes around: It's not about spending crazy amounts, nor is it about having a 'Down with the system' attitude. You could be counter-productive in both, and you're somehow punishing your partner in the second option. Keep your eyes on what's important, celebrate Love, celebrate your Relationship. If you don't do it everyday it's already bad enough, so abstaining on the one day the world give you a free excuse to be silly and crazy in love is just wrong. As for the single ones out there, think of this holiday as a Christmas away from your family. It's probably futile to try to spend it with the 'next best thing relative', so you might as well spend it with people you care about, such as your friends. Treating it as any other day would be such a waste.